We started in 2006, and the graduates of the workshop speak for themselves in their testimonies on this page. William Levy, Jencarlos Canela, Elizabeth Gutierrez, Julian Gil, Daniel Elbittar, Mariana Torres, Maritza Bustamante, Jason Canela, Ana Lorena Sánchez, Victoria Camacho and Scarlett Gruber are just some of the actors trained by Sebastián Ligarde. The workshop is always reinventing itself, offering new techniques and courses and has achieved an international reputation. We have had students who come to study with us from Italy, Holland, Germany, Spain, Argentina, Peru, Uruguay, Brazil, Colombia, Ecuador, Venezuela, Cuba, Dominican Republic and Mexico. We have also had students from many different cities in the United States of America. 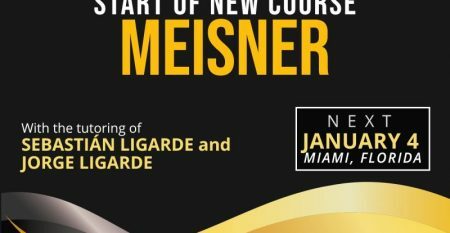 The Meisner Technique not only helps you if you are an actor. It also serves to overcome shyness and stage fright for public speakers, many psychologists have gone through our workshop and are delighted as this technique helps them to be aware of their “defense mechanisms”. Thanks for the support and for believing in us unconditionally. There are two types of actors, those who should be working in a supermarket and then those who are like Sebastián Ligarde. What I most enjoyed working with Sebastian was to challenge him daily. Every time he challenged him in an interpretation he succeeded, then challenged him more and succeeded again. It is true that the directors can teach the actors a lot, but suddenly you find an actor like Sebastian who teaches the directors. María Eugenia Perera He directed Sebastian in: "Olvidarte Jamás". "Mi Vida eres Tu". "Acorralada". There are several types of actors, but Sebastian belongs to what I consider the best group of all. It always arrives with several proposals for each scene, for each character. However, he always knows how to listen to my proposal and always accepts my decision as a stage director and does not discuss the subject again. Sergio Jiménez Creator of talents, actor, director. "The teacher" He directed Sebastian in: "I live by Elena" and "Salome". When I met you at the home of Jeancarlos Canela, I never imagined that you would mark a before and after in my life. Until that moment you were just the great villain and a tremendous actor. Six months later, you, your workshop and your much-studied "manuscript" have become an essential part of my life. I have no words to describe how much I have learned, not only in the application of your teachings for our "show business", but for my life itself. You are simply spectacular. You are a dedicated man, passionate as an actor, as a teacher and as a human being. Each class you add the most important ingredient of all, love. This without mentioning a fundamental part of each class, your delicious "Mexican sauces" at the time of the break. The acting technique that Sebastián Ligarde taught me has been key in my development as an actress. In addition, he is an admirable person for the dedication and dedication to his career, and to his courses. Thanks for all your teachings. I love you, Yeyo. Elizabeth Gutierrez Protagonist in: "Amor Comprado", 2007 (Venevision Productions, Miami). "El Rostro de Analia" 2008 (Telemundo / NBC Productions, Miami). Three years ago my brother Jean Carlos asked me to accompany him to his acting class. When he told me that the class lasted 4 hours, I told him I was crazy and that I would never take a class like that. However, I accompanied him, and as I passed the time and listened to Sebastián Ligarde, I realized that those 4 hours were the beginning of what would be the rest of my life. I fall short to say that I fell in love with the art of acting. Since then I have been a student of Sebastián Ligarde, whom I consider to be simply the best teacher I have ever had in my life. When he teaches his classes, the students perceive the love and passion Sebastian feels. He does not teach by occupation. He teaches out of necessity, because he loves his profession. It is a gesture of enormous generosity that he shares what he learned throughout his successful career. Others would have retired to their homes and kept their experiences in a drawer. As the teacher says: "If you want to act, then do it, You are your only limitation." Star Debut: Donde Esta Elisa? (Telemundo, 2010). Being in a Sebastian workshop is immersing yourself in a high level of acting learning and a deep analysis of the character. Sebastián Ligarde taught me how to handle a very important technique for TV that is acting minimalism. 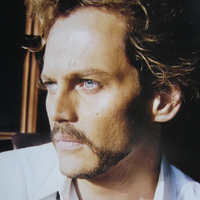 Sebastian taught me that an actor should be responsible, punctual, disciplined and dedicated to his career and character. 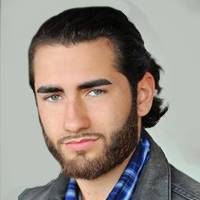 Daniel Elbittar Protagonist in: "Olvidarte Jamás" (Venevision Productions, Miami). "Tengo Todo" (Azteca Televisión, Mexico). Subscribe now and receive weekly newsletters with educational materials, new courses, interesting publications and much more!